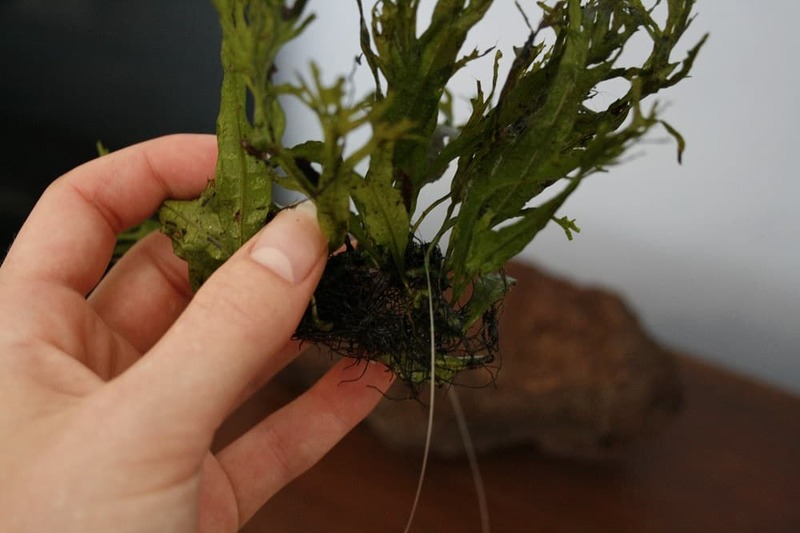 Most aquatic plants should be planted with their roots in the substrate just like regular plants – however, there are a few exceptions. Some of the most popular aquarium plants, like Java fern and Anubias varieties, should actually be tied to rock or driftwood. When planted in the substrate, they will grow very slowly or even die off completely. There are multiple methods that can be used to tie aquatic plants to rock or driftwood; I personally prefer to use fishing line. Keep scrolling for a photo tutorial and some helpful extra tips! Note: A full Java fern caresheet can be found here. A caresheet for Anubias can be found here. Collect your materials! The rock I used is not in the photo, but I went for lava rock. The plant is Lace Java fern, one of my favorite low-maintenance aquarium plants. Put the plant in the desired spot. Tie it up. 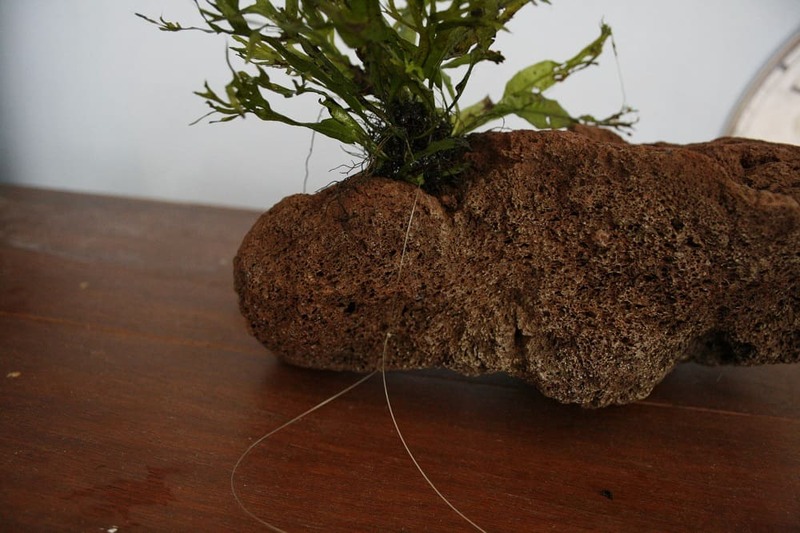 Make sure the tie is not too loose, or your plant might ‘escape’ when you put the rock/driftwood in the tank. 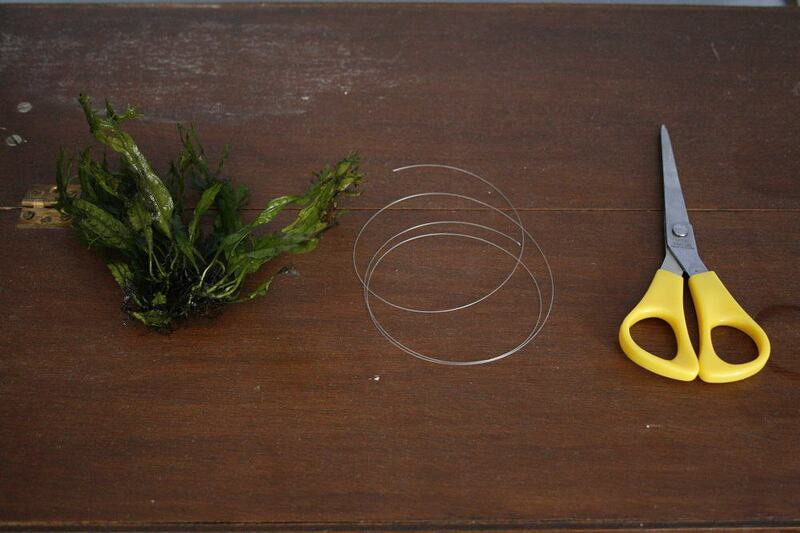 Cut off the excess fishing line so your fish won’t get tangled up. That’s it! 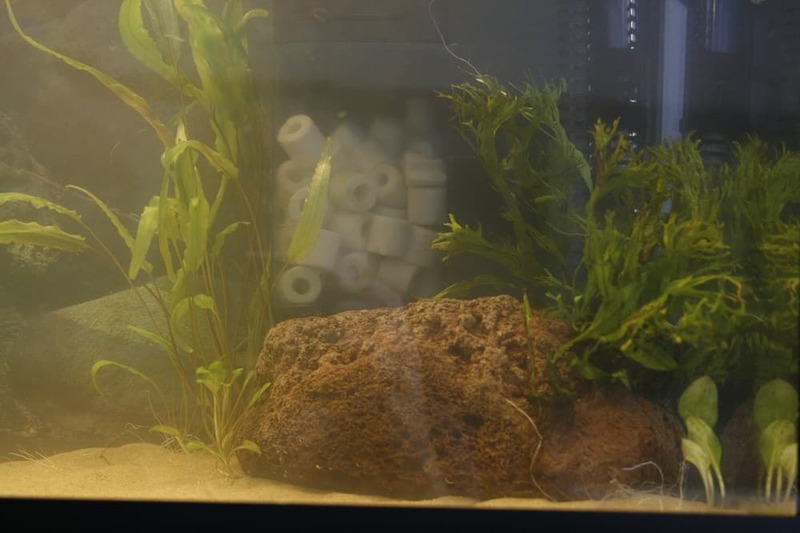 You can now put the rock/driftwood in the aquarium. The plant may look a bit too small right now, but don’t worry about that: it’ll look like the lush forest pictured at the top soon enough. 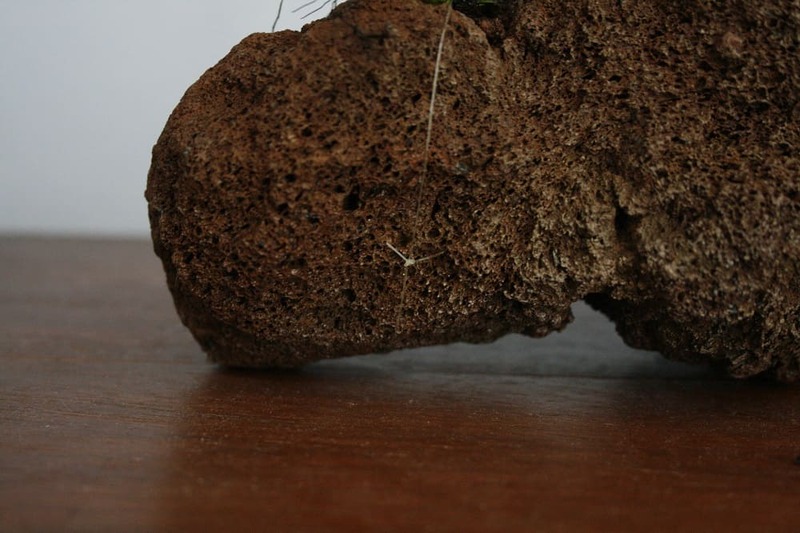 When choosing rock/driftwood, try not to go for something with a really smooth surface, because the plant will be unable to root properly. My personal favorite is lava rock, because it’s very light and easy for the plant to root in. Try tying the knot at the bottom of the rock so fish can’t hurt themselves on the edges of the fishing line; this is especially important when dealing with clumsy fancy goldfish or fish with long fins like bettas. 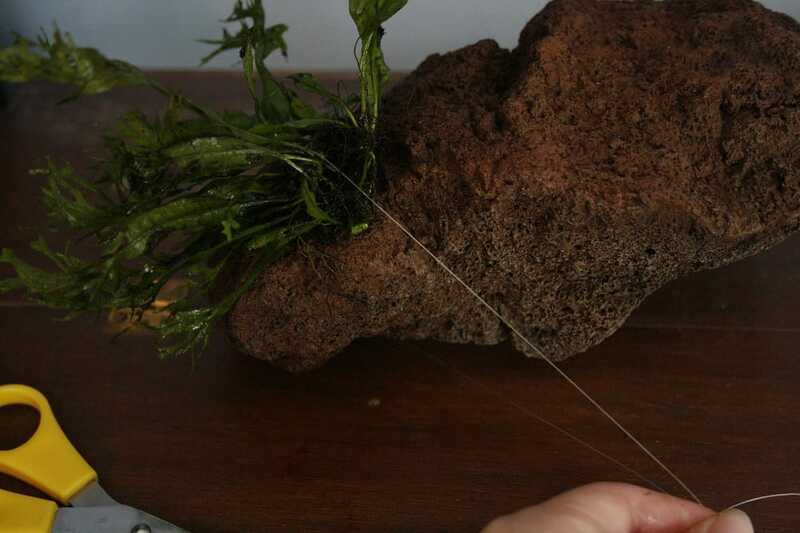 Once the plant has rooted, the fishing line won’t be necessary any more; you can cut it off and the plant will stay on the rock/driftwood on its own. If you have any questions this tutorial or additional advice, leave a comment below. Happy fishkeeping!